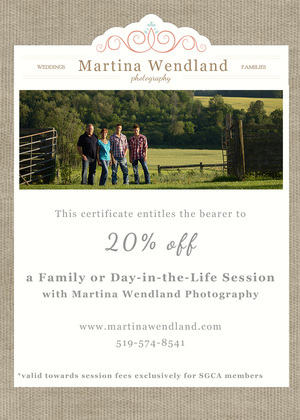 20% off a Family or Day-in-the-Life Session with Martina Wendland Photography. More details are available at www.martinawendland.com/. This page contains a single entry by Settlers Grove Admin published on September 27, 2011 10:15 PM. Settlers Grove Community BBQ was the previous entry in this blog. 2011 Winter Holiday Season Celebration is the next entry in this blog.